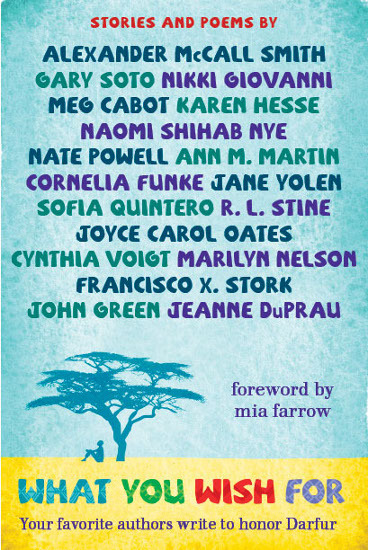 June 20, 2012 — World Refugee Day — Book Wish Foundation is thrilled to announce that Iridimi Refugee Camp in eastern Chad will be the location of the first library funded by our charity anthology What You Wish For. The library will have a capacity of up to 20,000 books, and will focus on providing basic literacy for adults and youth who have never been to school, women and men equally. Thanks to the authors who generously contributed their writing, the readers who purchased the book, and many other supporters, more than 19,000 refugees from Darfur will gain access to books targeted to their interests and reading skills. This webpage will collect details about the ongoing project, which was formalized by a Memorandum of Understanding between Book Wish Foundation and the UN Refugee Agency, UNHCR. Iridimi is one of the 12 refugee camps in eastern Chad that are home to nearly 285,000 refugees who fled from the genocide in Darfur across the border in Sudan. More than half of the refugees are children, and most have known no other home than these remote camps since 2004. 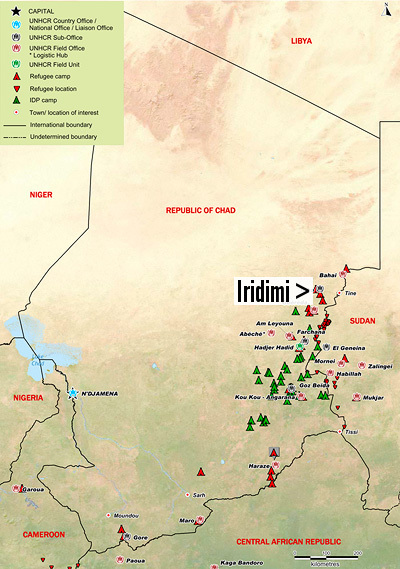 As of February 2012, Iridimi's population was approximately 19,400 refugees, spread across 3.6 square miles of tents and reed shelters in the desert. The building is centrally located in the camp and adjacent to two primary school buildings. Proximity to the school buildings is especially important because this will make it easier for the teachers, who are themselves refugees, to use the library. When teachers learn from educational books in the library, they can share their new knowledge with their students, multiplying the impact of the books. The building will have a capacity for 20,000 books. This is a significant number, but it is really just more than 1 book per capita. How many books are in all the public libraries, school libraries, and homes in your town, in comparison with its population? The building, which serves as a youth center, already has refugee librarians who manage its current very small collection of books. This means less training will be required, and the librarians will already be somewhat familiar with the needs of the camp population. Regarding the last point, the UN Refugee Agency indicated that Iridimi's existing books are insufficient not only in quantity, but also in their relevance to the camp population. They are either too difficult for children (or newly literate adults) to read, or they do not cover enough subjects of interest. With funding for a 20,000-book library, we can remedy this, provided that we have a good understanding of the reading needs of the refugees. Therefore, Book Wish Foundation has asked the UN Refugee Agency to conduct a survey of reading needs in Iridimi. The "Wish" in Book Wish Foundation signifies our commitment to giving needy readers the books they wish for. We always try to learn first what books readers want, as specifically as possible, and then obtain those books. In a place like Iridimi Refugee Camp, this is not just a question of subject matter, but also language and reading level. And, unfortunately, it's a difficult question to answer because of the size of the camp, its very tough living conditions, and the refugees' general lack of exposure to books. There has not even been a formal literacy survey, although the UN Refugee Agency estimates the overall literacy rate at under 50%. Books for learning the English language, especially the Headway series published by Oxford University Press. (Oxford University Press previously donated and discounted Headway books that were requested for our prior work in three of the other refugee camps, Bredjing, Treguine, and Gaga.) Also, titles from the Macmillan Readers series. Books for learning the Arabic language at the primary school level, plus Arabic grammar textbooks at the primary, secondary, and university level. Dictionaries: English, Arabic, and English<->Arabic. Arabic books about women's empowerment, women's studies, and biographies of prominent women. Arabic books about liberty, justice, peace, and social issues. Arabic novels and books of short stories, especially in the following genres: fables/folk tales, adventure, comedy, historical fiction, police/detective. Books by Sudanese author Tayeb Salih. Pre-Islamic and modern Arabic poetry. Arabic books about cattle breeding, poultry, husbandry, and basic agriculture. Arabic books about small business and commerce, including accounting, management, and insurance. These will complement an entrepreneurship training course for refugees that is taught in the youth center, and help refugees run small-scale income-generation projects in Iridimi. Arabic math textbooks and math reference books at the primary, secondary, and university level. Arabic geography textbooks and atlases, covering both modern and historical geography. Arabic books about Sudanese and world history. Arabic books about environmental protection. Arabic reference books at the primary, secondary, and university level. Introductory books for learning to use computers and reference materials/e-books on CD/DVD. Iridimi has seven Windows 7 computers that refugees can use with CD/DVD drives, USB, and 1 GB RAM. Audio books, especially for children, with solar-rechargeable CD/MP3 players. About 75% of the library's books will be academic/educational, with 50% of those at the primary school level, 30% at the secondary school level, and 20% at the university level. About 25%, or 5,000 books, will include fiction and other free-reading topics, with 40% of those being picture books, 25% at the primary school level, 25% at the secondary school level, and 10% at the university level. Books at a primary or secondary school reading level will not just be for children — many adult refugees lack schooling or are newly literate. About half of the academic books will be tied to the official Sudanese curriculum, so that the Darfuris can pass the Sudanese school exams and receive school credit in Sudan, if they are ever able to return. This is especially important for secondary school-level books, since there is no formal secondary education in the refugee camps in eastern Chad. We envision that the library will have a significant impact on informal secondary education in Iridimi. Book Wish Foundation has already transferred funds to the UN Refugee Agency to cover the cost of bookshelves and other basic library furnishings, as well as part of the book budget, for preliminary purchases. With information from the book survey, we and the UN Refugee Agency are now beginning the process of sourcing matching books. Which requested books we obtain vs. the UN Refugee Agency will depend on the books' availability in Chad and Sudan, our ability to obtain requested books from other countries at discounted prices or as donations, and the costs of shipping to Chad. Delivering books to refugee camps in eastern Chad is difficult, expensive, and, sometimes, even dangerous. Whatever requested books we obtain we will ship to Chad's capital, N'Djamena, where the UN Refugee Agency will take custody for the journey in-country to Iridimi. If you want to help us bring libraries to the other 11 Darfuri refugee camps in eastern Chad (currently, we can only fund the Iridimi library), we welcome donations of any amount (tax-deductible in the U.S.). You will also be contributing if you purchase a copy of What You Wish For. We are giving all of our proceeds to the UN Refugee Agency for Darfuri refugee camp library development, and all of the authors and our literary agent worked pro bono. Please do NOT send us books. More than 9 out of 10 times, when someone sends us a book unsolicited, it is not appropriate for the refugees, so we strongly discourage this. We do not seek general book donations. Instead, if you think you have a book that matches one of the items listed above in the survey of reading needs, please contact us FIRST with the details, and then send the book ONLY IF we say it is a good match. This will save your time and ours, and your postage expense, and ensure that your book is not wasted — it might find a more appropriate home somewhere else. In addition to everyone who purchased What You Wish For or donated to have his/her name printed in the book, plus all of our other donors, we are delighted to acknowledge the especially generous support of the New Jersey State Library, North Hunterdon High School (Annandale, NJ), Angie Longenecker, the Levenger Foundation, Pam Omidyar, Cassandra and Vernon S., the Lane Family and Girl Scout Troop 5712, Washington Township Public High School IMC (Sewell, NJ), the Brunson Family, Janice L. Wilkins, Peta Davies, Natalie Wardle, Better World Books, Rancocas Valley Regional High School Library (Mt. Holly, NJ), Cape May County Library (Cape May Court House, NJ), Readington Middle School (Whitehouse Station, NJ), Pennsauken Free Public Library (Pennsauken, NJ), Middletown Township Public Library (Middletown, NJ), and the Lodi Memorial Library (Lodi, NJ). Thanks to these individuals, organizations, schools, and libraries for contributing so significantly towards the Iridimi Refugee Camp library, and, therefore, towards the education and well-being of more than 19,000 of the world's most vulnerable readers.